Ganga Saptami is believed to be the day when Ganga River descended onto Earth. In 2019, the date of Ganga Saptami is May 11. Some scholars call it as the birthday or birth anniversary of Goddess Ganga. The day is also known as Jahnu Saptami. It is mentioned in numerous Hindu scriptures that Ganga descended on earth on the seventh day of the Shukla Paksha (waxing phase of moon) in Vaisakha month. This is an important festival for many spiritual organizations. Special pujas and rituals are offered to Goddess Ganga on the day. Details of Goddess Ganga descending on to the earth on the seventh during the Shukla Paksha of Vaisakh month is mentioned in the Padma Purana and Narada Purana. Ganga was brought down on to earth by King Bhagiratha. He did this for the salvation of his ancestors who were turned into ashes by Sage Kapila. All the 60,000 ancestors of King Bhagiratha attained moksha. From that day onwards Ganga also came to be known as Mokshadayini. There river is known as Mandakini in heaven; as Ganga on earth and as Bhogvati in the patala (netherworld of underworld). As per Vishnu Purana, Ganga originates from the feet of vishnu - from the nail on the thumb of this left feet. Nalini, Haldini and Pavani in northside. Bhagirati (Ganga) the seventh river flowed southeast. Ganga is also believed to be the daughter of Himavan (king of mountains) and Maneka his spouse. This is because she has her origins in the Himalayas. As she is the daughter of Himavan, she is also the sister of Goddess Parvati. Kartik, son of Shiva, was born on Ganga River and therefore she is also one of the mothers of Kartikeya – Muruga or Skanda. As per Puranas, Ganga travels on a crocodile (makara). She hold Kalash (symbol of water, life and fertility). In the Nadi Sutra in Rig Veda, Ganga is mentioned. Those worshiping Ganga River on the Ganga Saptami day will have all their sins washed away. Those undertaking holy dip in the river on the day will attain moksha or salvation. In Haridwar and other regions, Ganga Saptami is believed to be the day when Goddess Ganga descended from heaven onto Lord Shiva’s matted locks and then flowed onto the Himalayas. Therefore the day is observed as Ganga Jayanti. 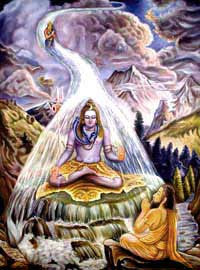 Another legend has it that Ganga River violently entered into the ashram of Saint Jahnu and distributed his meditation. Overwhelmed by the anger Jahnu Rishi drank Ganga and released her through his ear. This day is marked as Ganga Saptami. It must be noted here that some scriptures suggest that Ganga appeared on earth on Akshaya Tritiya day and some during Ganga Dusshera in Jyeshta month. What do Hindus Do on Ganga Saptami? Holy dip in the river. The belief is that Ganga will bless her devotees with all kinds of worldly pleasures, peace and prosperity. Bad luck will change into good luck. Puja, worship, prayers and holy bath on the day will help in curing physical ailments. Chanting anyone of the above mantra 108 times on the day will help in desire fulfillment.